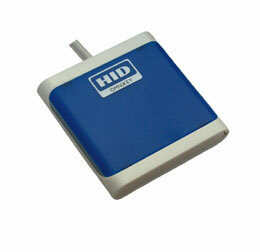 The Omnikey 5021 CL from HID is a 13.56 MHz contactless smartcard reader that supports a wide range of contacless technologies, including iClass, MIFARE, MIFARE DESFire, SMART-MX, ICODE and TagIT. Representing a brand new design that features a convenient pocket size as well as an optional desk/wall mount on the back, the Omnikey 5021 CL enables new markets, such as Healthcare, to benefit from the use of secure smartcard technology. The reader leverages existing Omnikey driver platform and provides Windows Plug-and-Play support. This way, the Omnikey 5021 CL can be seamlessly integrated into most end-user environments with little to no administration. Designed to suit space-conscious environments, this sleek and stylish reader supports the use of contactless physical access as well as PKI cards. The Omnikey 5021 CL is compliant with ISO specifications 14443 A and B and 15693.